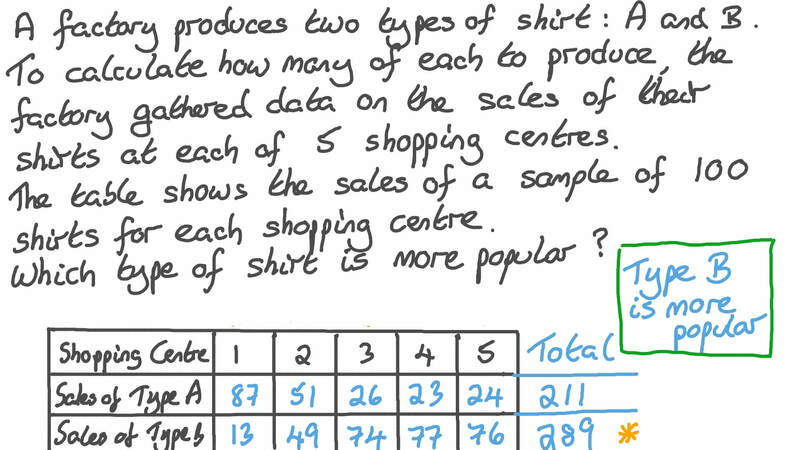 In this lesson, we will learn how to read and compare data. This graph shows the number of football matches that two teams played in five months. 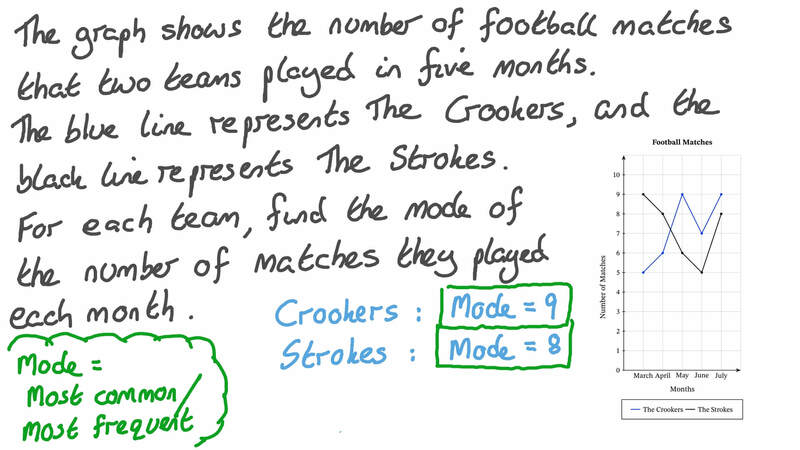 The blue broken line represents The Crookers, and the black broken line represents The Strokes. For each team, find the mode of the number of matches they played each month. A factory produces two types of shirt: A and B. To calculate how many of each to produce, the factory gathered data on the sales of their shirts at each of 5 shopping centres. The table shows the sales of a sample of 100 shirts for each shopping centre. Which type of shirt is more popular? This broken-line graph shows the scores achieved by two volleyball teams in each of five weeks. Compare the median scores of each team, and interpret the difference between them. AThe Blue Jays have a higher median score, which suggests that, overall, their scores were higher than the other team. BThe Robins have a higher median score, which suggests that, overall, their scores were higher than the other team. The broken line graph shows the number of matches that two volleyball teams, the Blue Jays and the Robins, played each month for 5 months. Calculate the median number of matches played by each team. These frequency diagrams compare the heights of tall buildings in two cities. Which city has more buildings that are at least 500 but less than 600 feet tall? These frequency diagrams compare the heights of tall buildings in two cities. Which city has the tallest building? This double box-and-whisker plot compares the prices of books in 2 bookshops. Which bookshop has a greater range of prices? The given graph shows console sales in the US from October 2008 to February 2010. Use this data to answer the following. During November 2009 and December 2009, what happened to Wii sales? During October 2008 and December 2008, what happened to Xbox 360 sales? Determine whether the following statement is true or false: During August 2009, the sales of the three consoles were almost the same. During December 2009 and January 2010, what happened to PS3 sales? Which console had the highest sales most of the time? During November 2009 and December 2009, which console had a higher increasing rate of sales? Is the relation between the sales for each console and time linear or nonlinear?